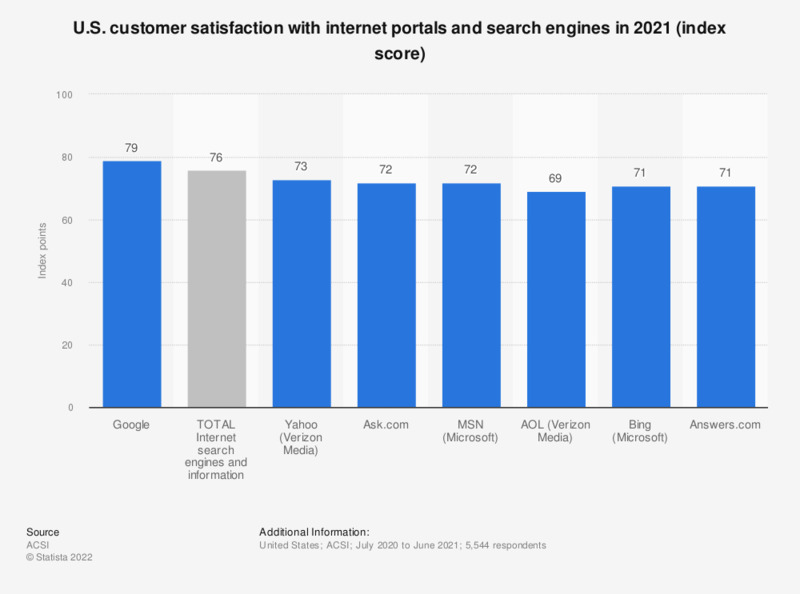 This statistic displays an annual comparison of U.S. user's satisfaction with online portals and search engines in 2018, according to the American Customer Satisfaction Index (ACSI). In 2018, market leader Google was ranked first with 82 out of 100 ACSI index points. Google's popularity is not only based on its leading position within the online search market but also related to the wide selection of online products offered by the company. ACSI reports scores on a 0 to 100 scale at the national level and produces indexes for 10 economic sectors, 47 industries (including e-commerce and e-business), more than 225 companies, and over 200 federal or local government services. In addition to the company-level satisfaction scores, ACSI produces scores for the causes and consequences of customer satisfaction and their relationships. The measured companies, industries, and sectors are broadly representative of the U.S. economy serving American households.